3 Bedroom Semi Detached House To Rent in Esher for £2,495 per Calendar Month. A very stylish, three double bedroom, two bathroom semi-detached family home located in a quiet residential road within only a five minute walk to Esher mainline station. 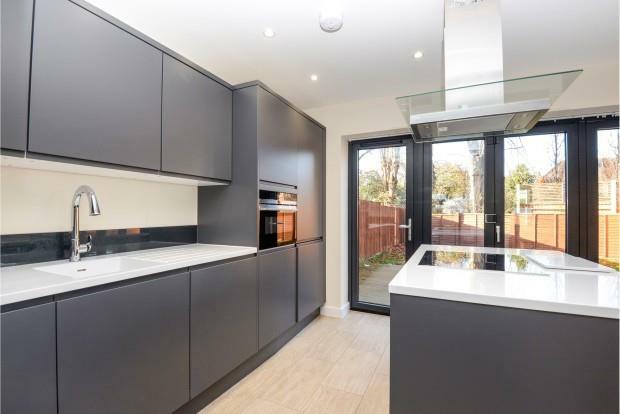 Features spacious, bright open plan living with a luxurious kitchen with breakfast bar leading onto a dining area overlooking the rear gardens via full length bi-folding doors on a decked terrace. The contemporary decor and finishes feature throughout the home to include; light oak wood and tiled floors, light oak doors, neutral light decor, brushed chrome door furniture and sockets, -Porcelanosa- tiles, bathroom fittings and chrome towel rails, Siemens integrated kitchen appliances; Electric induction hob, electric oven, overhead extractor, dishwasher, washing machine, gas fired central heating and fully double glazed. Accommodation comprises; hallway with storage, cloakroom w.c., stunning open plan kitchen and dining area, reception room. First floor, master double bedroom with en-suite shower room, two further double bedrooms, family bathroom with shower over bath. Outside; large lawned southerly aspect rear garden with side access. The picturesque open spaces of Weston Green with its quintessentially English local country style pub and duck pond is within a 10 minute walk. Esher mainline station has frequent services to London (Waterloo) and the Village of Thames Ditton with its cafes, small independent shops, restaurants and library is also nearby.